When I read Legend, I fell in love with it. I rated it 5 stars. 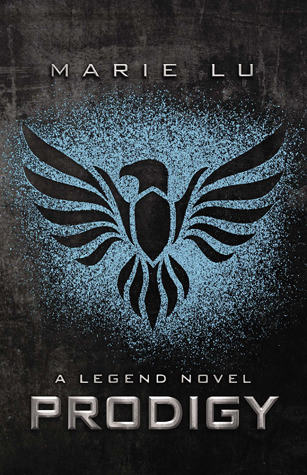 Everything was so well thought out and the world Marie Lu creates is vivid and realistic. I just wanted to know more! Well, this book gave me more. So much more. The map at the beginning is awesome. I want to see world maps, know more about the world and the flooding. It’s all so fascinating. The action kept me moving, wanting the book to come to the conclusion I could see coming. Then something strange happened. The climax was not the end. The book continued, building toward another ending. I didn’t know what was coming, or how to react. I am used to most books following a similar pattern. I was thrown off course. My characters continued down a new path, and then that path concluded. And I was still left in mystery, because it again kept going. The ending was long, and I was afraid to finish, not knowing why there were still letters to read and pages to turn. However different this book is, it’s not bad. Different is good! How many times have I lamented because I wanted a book to keep going and give me more of the story? Pretty much every book I’ve ever loved. This book gave me what I long for. And all in all, this book was fantastic. It was so much more than Legend, and better for it. And while the ending had me weeping and sure there would be no more books because it just ended so much like a good novel can, it felt like it couldn’t be over. What’s a two part book series? If that was the case, Prodigy could have been split into two books and expanded on. I felt like there must be more to the story. It seems that the third installment, Champion, will be released next year. I am glad it ended like it did. I’m glad that I have hope for the next book, but I’m also not going crazy with anticipation, hating that I read it right when it was published. This book ended, this part of the story concluded. It didn’t leave me hanging, but there are definitely some things that I want to know and I will read Champion as soon as it is released next year. I highly recommend this book and this series. It is dystopian fiction at its best. This cover fits the book perfectly. It’s functional, and reminds me a lot of what it might look like if June designed it. Simple and gets the point across. But it’s also gorgeous in it’s minimalist way. I like this cover so much better than Legend. Legend was too metallic for me, I didn’t like the sheen. I know. Pick pick pick. This is great though! I can’t wait to move and unpack and put all my books on my shelves! This is one of the best book trailers I’ve ever seen….even though I don’t picture June like that and I wanted to see Day’s hair. If you are still wavering at all about this book or this series, watch it here. There’s also a game based on Legend….cool! Click here to check out the fb page. I have been around the page, but I haven’t played it, so if you have, leave a comment! got this in my to read pile, really must get on with it!